Our experience in the vehicle shipping industry has equipped us with the know-how’s to efficiently transport any oversized vehicles. We’ve handled numerous of oversized vehicle transport ranging from small vans, modified or lifted trucks, military vehicles, food truck transport and all the way up to RV transport commercial buses and haul heavy equipment. Simply put, if you’re in need of shipping large autos, we’re the company capable and able of getting it done. In the search for their next collector’s item, military museums and enthusiast might find a decommissioned military vehicle or equipment. 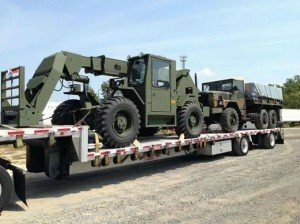 We can help you haul heavy military vehicles and equipment from A to B. Lifted and modified trucks have become a popular trend in the recent years. Unlike many other carriers, we’ve kept up with the demand and are able to transport trucks that are large and modified anywhere in the U.S.
A landslide of food trucks across America has started. Our lowboy and RGN trailers can handle the oversize and weight to transport food trucks across town or across the country. Finding the right company to transport oversize autos is as difficult as the task itself. Many transport companies lack the expertise of shipping large cars and as a result shy away from the challenge. Because no two oversized auto transports are the same, there are details specific only to your move we examine to handle your transport and help facilitate the process. 1 | Vehicle Type – Year, make and model. 2 | Dimensions – Length, height, width and weight of the vehicle. Dimensions must be verified. 3 | Condition – Is the vehicle in operable condition or will inoperable vehicle transport be needed? 4 | Attachments – Are there any attachments on the vehicle? E.g. roof rack/mount, boom lift, trailer, water barrel etc. 5 | Route – How far will vehicle be traveling? Where is vehicle picking up and delivering? Is the vehicle shipping to Hawaii? 6 | Schedule – Are we working with a moving schedule? How soon or late can we pickup and deliver? 7 | Pickup/Delivery Location – Although our service is door to door, we’ll need enough space at pickup and delivery for our carrier to safely load and unload the vehicle. Remember that our carriers are generally 80 feet in length. Need Large Vehicle Transport Enclosed? With the new addition of curtain side carriers to our team, we’re able to transport oversized cars enclosed. Our step-decks and lowboys carriers are now equipped with Conestoga trailers to protect large modified cars measuring up to 40′ in length and 9′ 9″ in height during transit.